In this presentation we will develop a simple model of generating and receiving light with antennas, and transmission of light through filters. First, developing a simple model of light, and sending and receiving light using antennas. Our working model of light (considering that we are covering this topic before electromagnetism) is a transverse wave, much like along this length of rope. The periodic disturbances travel along the rope, while the disturbances themselves wiggle back-and-forth sideways to the rope, in this case vertically (due to the person shaking the rope up-and-down), but these disturbances could also be horizontal, if the person shakes the rope side-to-side. The direction of these disturbances (which are perpendicular to the direction along the rope) correspond to the polarization of the transverse wave. The sources of light are vibrating charges, such as atoms and electrons. If these charges vibrate in random directions, such as this molten sample, then they will generate unpolarized light, meaning that all possible polarization directions (vertical, horizontal, diagonal, etc.) perpendicular to the direction of motion are included. 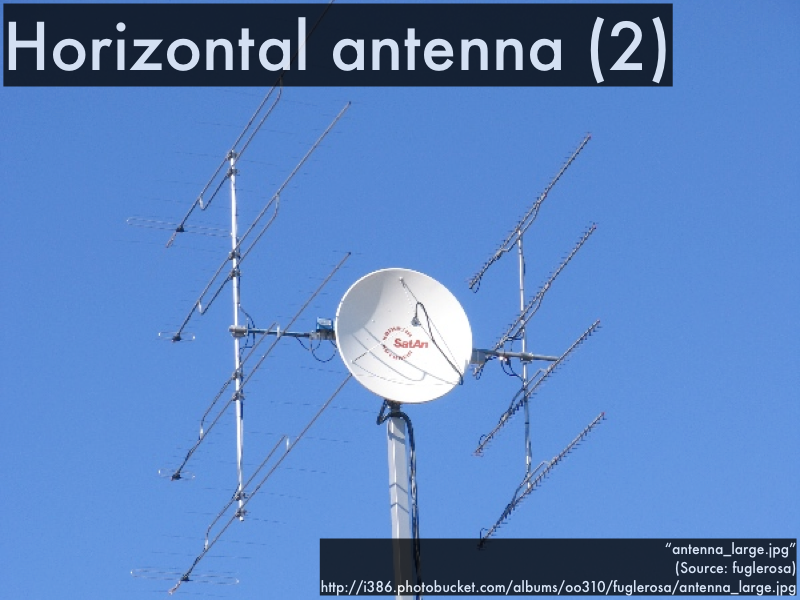 In contrast, a radio antenna is an example of a polarized light source, as electrons are forced to flow up-and-down the length this vertical antenna, such that the light (in the form of radio waves) will in this case have only vertical polarization. 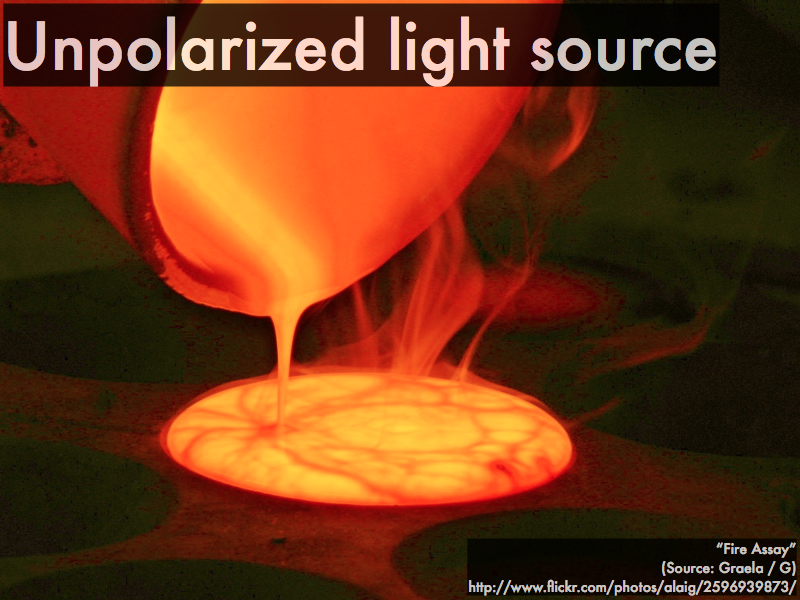 Let's extend this concept of sources and receivers of polarized light. This is a schematic model of what happens when electrons are force to oscillate up-and-down along a vertical antenna. 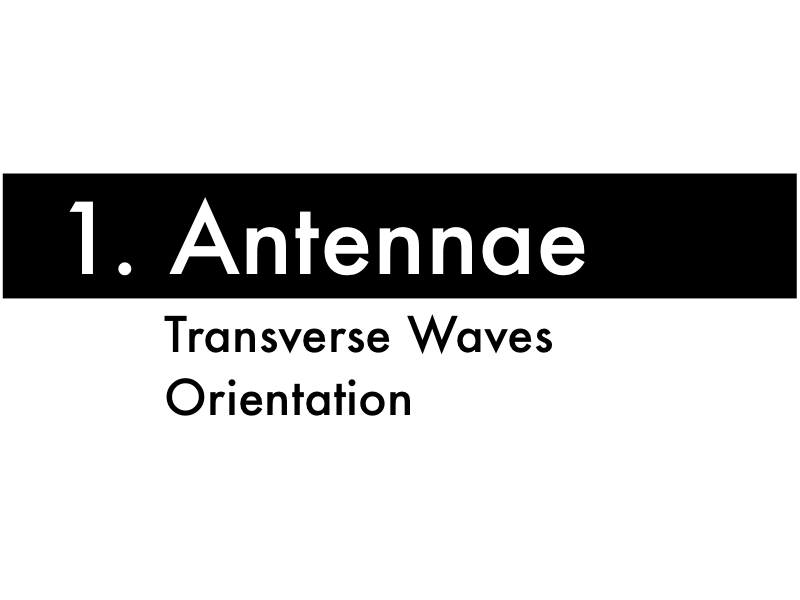 This generates radio waves with transverse peaks and troughs that are aligned vertically. In order to best receive this radio wave, a receiving antenna would need to be aligned vertically as well. 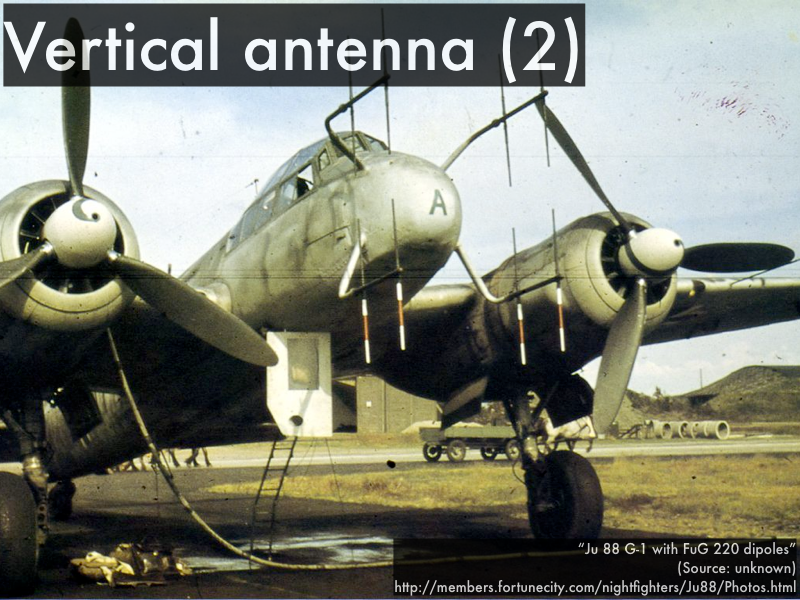 Here we have a practical example of a vertical antenna array. This will produce vertically polarized radio waves in all directions (except for straight up above the airplane, and straight down below the airplane--can you figure out why?). We can demonstrate the production and reception of vertically polarized radio waves. 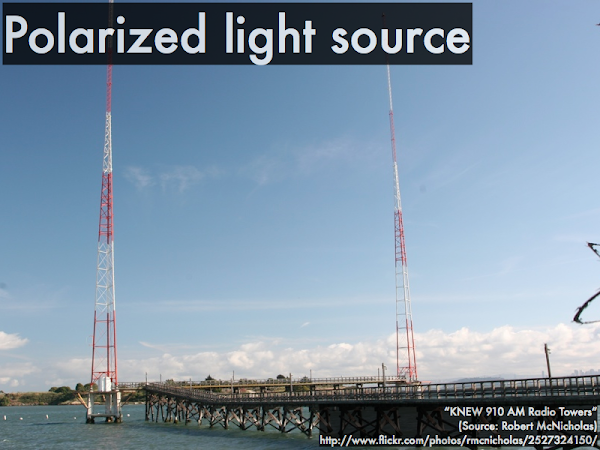 At left is a vertical antenna with electrons that oscillate up-and-down, generating vertically polarized radio waves. Holding a vertical antenna nearby will pick up the vertically polarized radio waves, causing electrons to oscillate up-and-down along the length of this receiver, producing a current that illuminates the bulb. Keep in mind that the energy to illuminate the bulb is transmitted from the vertical source antenna to the vertical receiver antenna. Here is a schematic model of what happens when electrons are force to oscillate side-to-side along a horizontal antenna. This generates radio waves with transverse peaks and troughs that are aligned horizontally. In order to best receive this radio wave, a receiving antenna would need to be aligned horizontally as well. Here we have a practical example of a horizontal antenna array. This will produce horizontally polarized radio waves in all directions (except towards the upper right of this picture, and away towards the lower left of this picture--can you figure out why?). We can also demonstrate the production and reception of horizontally polarized radio waves. At left is a horizontal antenna with electrons that oscillate side-to-side along its length, generating horizontally polarized radio waves. Holding a vertical receiver antenna nearby will not pick up these horizontally polarized radio waves, and no energy is received to illuminate the bulb. However, if the receiver antenna is aligned horizontally, then it will pick up the horizontally polarized radio waves, causing electrons to oscillate side-to-side along the length of this receiver and producing a current that illuminates the bulb. So for best reception, the relative orientations of the source antenna and receiving antenna should match. Second, let's consider what we can do to the polarization of light (in this case, visible light) while it is en route from a source to a receiver. In this movie, a T-1000 Terminator made of liquid metal is able to walk through the bars of this gate, but the gun it is holding sideways is caught between the bars, and must be held vertically in order to pass through the bars. This is the concept behind our "fencepost model" of the transmission (or blocking) of light with different polarizations: anything that is aligned parallel to the opening will pass through, while anything aligned perpendicular to the opening will be blocked. So in this model, light is represented by oscillations that travel along a rope. If the polarization of this light--the sideways direction of the oscillations on the rope--is parallel the direction of the openings between the fenceposts, then it will be transmitted through. 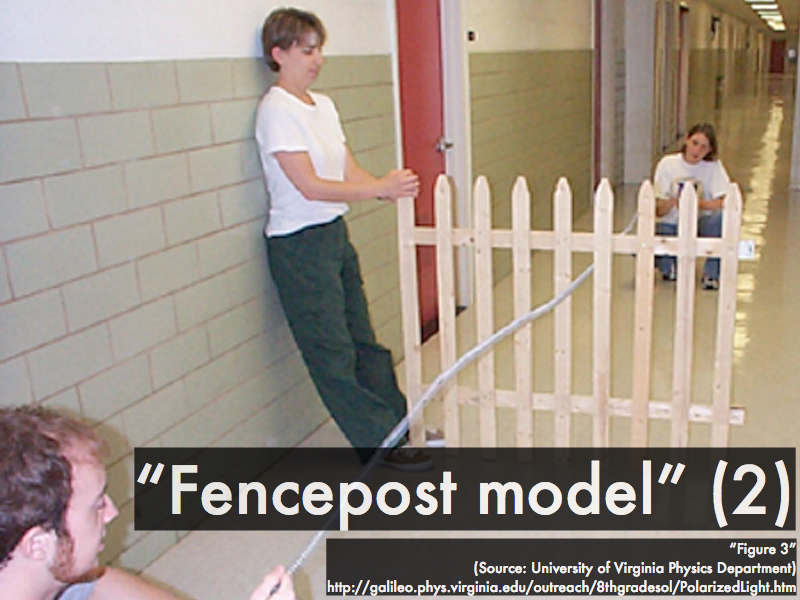 If the polarization of this light is perpendicular to the direction of the openings between the fenceposts, then it will be blocked. The set of fenceposts is said to be a polarizer, and the orientation of the openings between the fenceposts is the transmission axis of the polarizer. 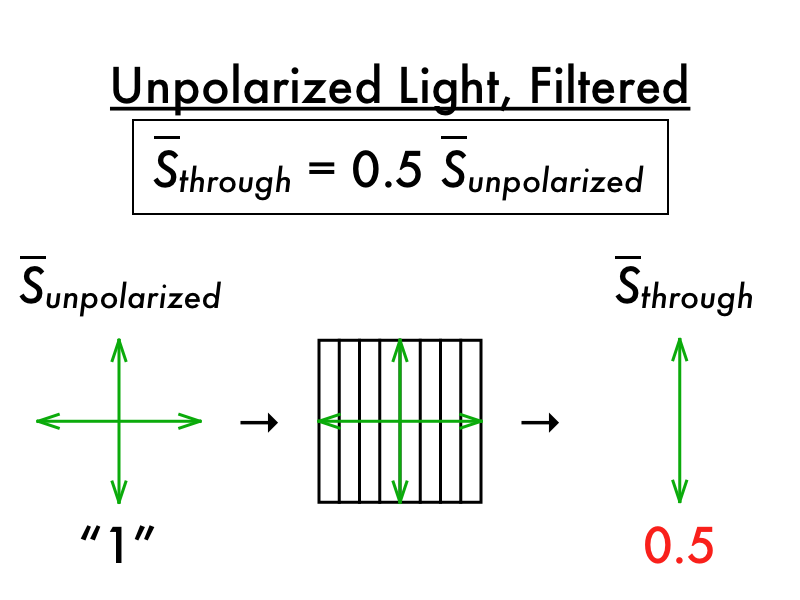 Let's separately consider the effects of a polarizer on filtering either unpolarized or polarized light. 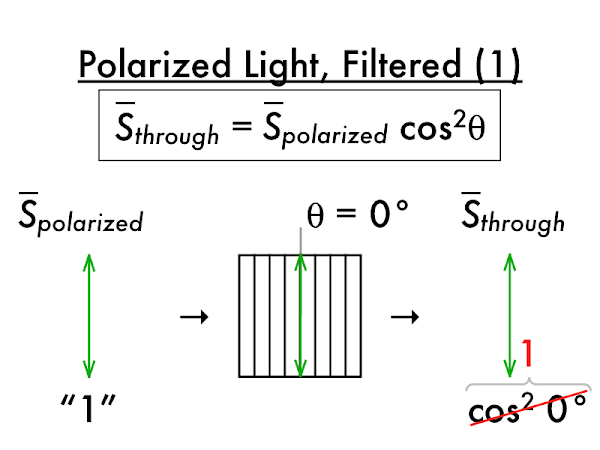 For unpolarized light here, traveling out of the plane of this page--with every possible sideways oscillation--is drawn with just horizontal and vertical polarization directions, and we assume that every other possible diagonal polarization direction is merely the superposition of these two polarization directions. If unpolarized light (with an original intensity S̄unpolarized = 1) is incident on a polarizer, then only the polarization direction parallel to the transmission axis (here, vertical) will pass through, and the polarization direction perpendicular to the transmission axis (here, horizontal) will be blocked. 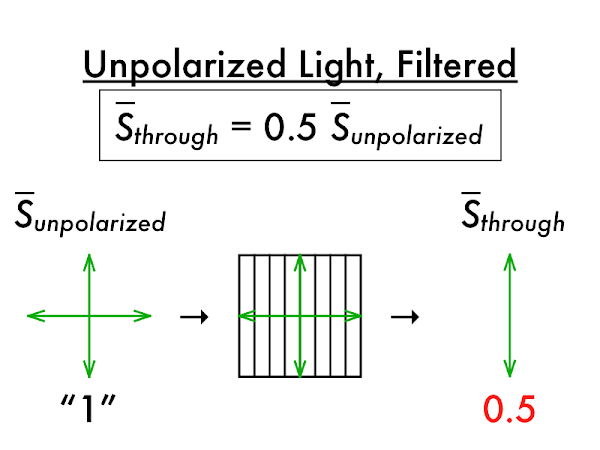 The result is that only one-half of the original intensity S̄unpolarized of unpolarized light will pass through the polarizer, and the remaining light will be vertically polarized with an intensity of S̄polarized = 0.5. 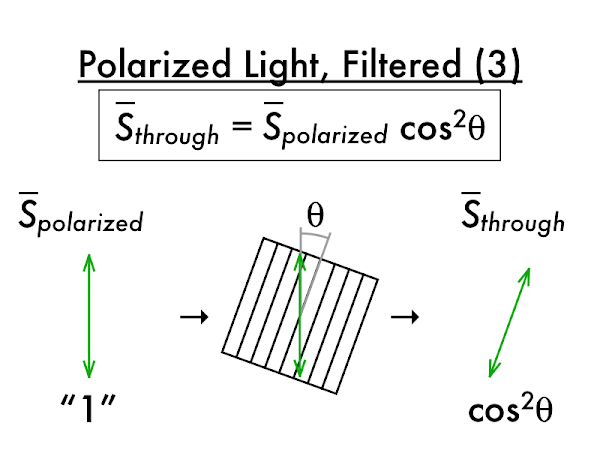 If instead polarized light (with an original intensity S̄polarized = 1) is incident on a polarizer, then S̄through, the intensity of light transmitted through will be given by Malus' law, which depends on the square of the cosine of the angle θ measured between the polarization of the incident light, and the transmission axis of the polarizer. 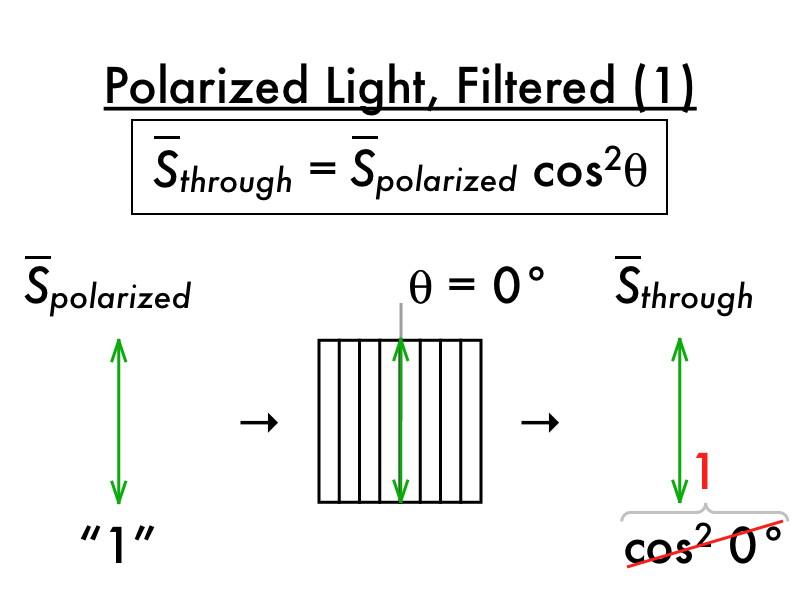 As expected, if the polarization of the incident light is parallel to the transmission axis of the polarizer (such that θ = 0°), then all of this light will pass through the polarizer, and S̄through = 1. 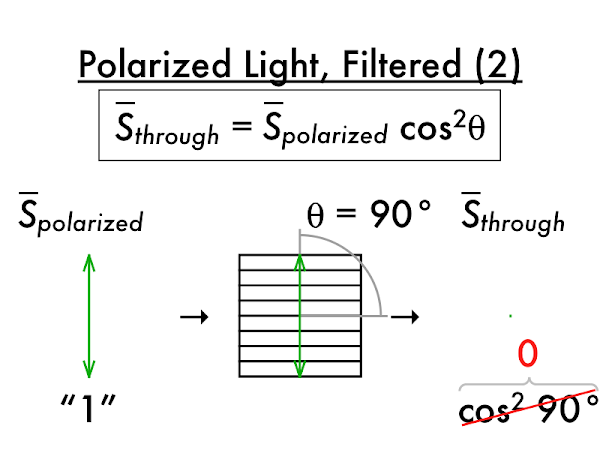 If the transmission axis of the polarizer was perpendicular to the polarization of the incident light (such that θ = 90°), then all of this light would be blocked (making S̄through = 0), as the square of cos(90°) = 0. 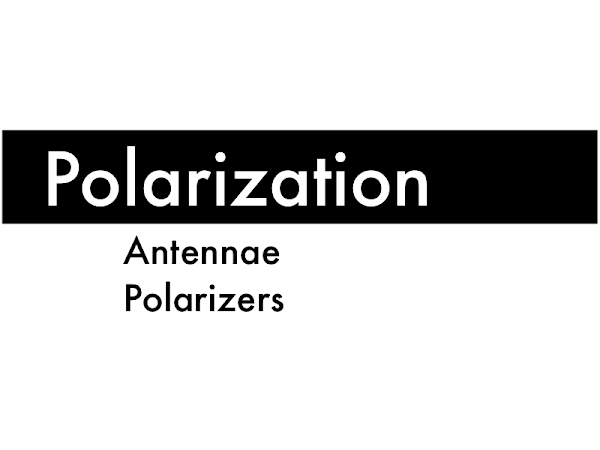 Now most generally the transmission axis of the polarizer may be at some arbitrary angle θ with respect to the polarization of the incident light. 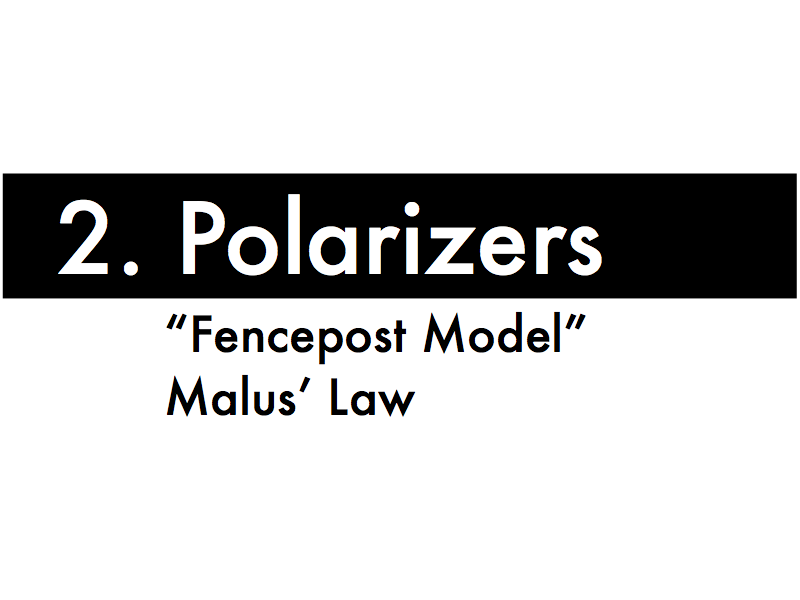 The intensity of the light that will pass through the polarizer is merely calculated via Malus' law, while the (lessened intensity) of light that passed through will have a polarization direction that exactly matches the transmission axis of the polarizer. Interesting things happen when polarizers are stacked such that light must pass through several of them. Here unpolarized light is projected through the first (smaller) polarizer. 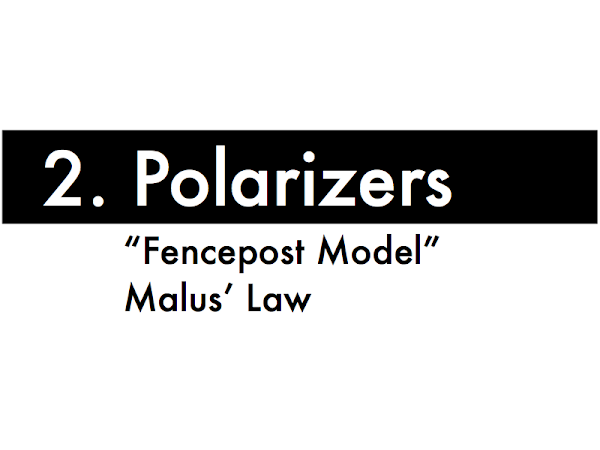 If the transmission axis of this first polarizer is horizontal, then one-half of the unpolarized light will pass through, and the light that passes through is now horizontally polarized. (C) diagonal, upper left to lower right. (D) diagonal, lower left to upper right. Back to the iPad (here, held in portrait mode) and polarizing sunglasses from the start of this presentation. Polarizing sunglasses are typically manufactured with a vertical transmission axis (to filter out horizontally polarized glare while fishing or driving). (C) diagonally (upper left to lower right) polarized. (D) diagonally (lower left to upper right) polarized. Now consider a Nexus 4 smartphone (again, held in portrait mode), and polarizing sunglasses (with a vertical transmission axis).